The first two pictures are done in oils by Gregory Hull. 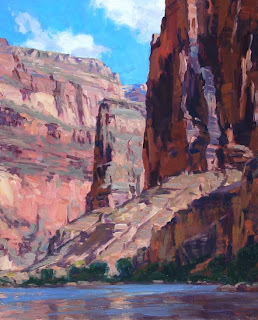 The Arizona Plein Air Painters will hold their 2nd Annual Members Show from April 2-11th at the Sedona Arts Center Community Gallery. The opening gala, beginning at 5pm on April 2, gives art enthusiasts an opportunity to meet the artists from across the state who will be participating in this prestigious annual event. Award winning Sedona artist Gregory Hull will judge the show and preside over awards presented during the gala to artists for the Best of Show painting and 2nd and 3rd place winners. There is no charge for admission to the gala. 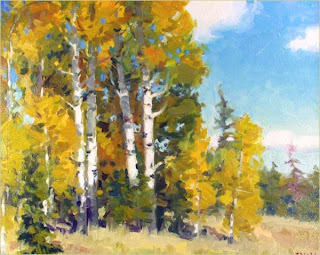 The Arizona Plein Air Painters (APAP) is a membership organization made up of professional and emerging Arizona artists who are dedicated to painting directly from life. Plein air paintings are often favored by art buyers because of the freshness and spontaneity that is evident in these works. APAP has a broad mission that includes art education, and natural and cultural heritage preservation, in addition to hosting art shows and local paint-outs for members. APAP preservation partners include the National Park Service, Arizona State Parks , and the Nature Conservancy. 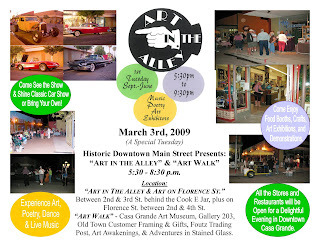 For additional information about this show and other planned events visit the APAP website at www.arizonapleinairpainters.com. 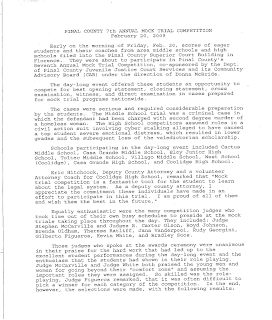 Pinal County Juvenile Court has a volunteer opportunity for those who would like to contribute time to young people who are trying to repair the harm they have caused to their individual communities. The Restorative Justice Panels involve community members working along-side court staff to hold youthful offenders personally responsible for their actions and to guide them toward repairing the harm they caused to victims and their community. This is done by having the family meet with community members to discuss their offense, what they are doing to make positive changes, how they will repair that harm and providing consequences. Communities with Panels include Casa Grande, Coolidge, Florence, Eloy, Apache Junction, Maricopa, Queen Creek and the Tri-Community area. Each panel meets monthly in the evening with a time commitment averaging 2 hours. Volunteers are required to go through a reference and fingerprint check as well as a Volunteer Orientation which are held on a quarterly basis. 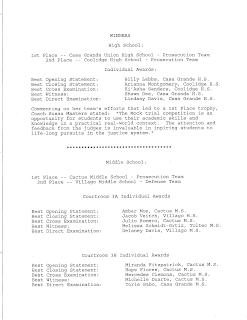 An orientation is scheduled for Saturday, April 18, 2009 from 9:30am – 11:30am in Florence. Registration is required. If you are interested in getting involved in your community, please contact Donna McBride at 520-866-4098 or DMcBride@courts.az.gov. Attorney and Pinal County Anti-Meth Coalition Chairman. Kelly Neal of the Pinal County Attorney's Office prosecuted the case. sentence before he is eligible for release.